The Read ‘n Style pen is the first digital pen beautifully designed to improve reading speed and comprehension, leaving a kid free to be a kid. Simply press the top mounted button and slide the device over the text. As it scans, the words will be read aloud in real time using a small, discreet Bluetooth earpiece. For the millions of Americans who struggle with dyslexia, reading can be the single biggest obstacle to achievement. All too often students with dyslexia are pushed away, held back, and swept under the rug. That ends now. We’ve created the Read ‘n Style pen to give students the tools to succeed. The idea for the Read ‘n Style pen began when Jamee was in elementary school. Like many others, she struggled with reading. When Jamee had homework, she went to her mom for help, and the two of them would sit at the kitchen table taking turns reading. Jamee would read a page out loud and her mom read the next to her. They would repeat this process back and forth until they were finished. When it was her mom’s turn to read, Jamee would follow along with her, reading the words on the page as her mom pronounced them out loud. Seeing the words, then listening to them pronounced helped Jamee understand what she was reading, improved her spelling, and built her vocabulary. Flash forward to 2013; Jamee’s in college trying to read the “wall of text” her professor assigned. “There’s no way I’ll even be able to finish half of this!” Jamee thought to herself in frustration. “I wish there was a better way.” Suddenly, the memories of all those late nights and early mornings reading with her mom came back to her, and she thought, “What if I had a device that did just what mom had done?” Lightning flashed and thunder rumbled throughout the room. The Read ‘n Style pen was born. At least that’s how Jamee tells it. The Read ‘n Style pen does more than just read text aloud for struggling readers, it helps kids learn to overcome obstacles on their own, boosting their self-confidence and making them more independent. Seeing the written words as they hear them pronounced has been shown to help students increase the size of their sight words, build their vocabulary, and improve their spelling. By using the Read ‘n Style pen, your son or daughter will become more efficient, knocking out their schoolwork in a fraction of the time. And because the Read ‘n Style pen can’t store information, students can use it on tests with no risk of cheating. The Read ‘n Style pen also helps students learn broad topics and concepts because it allows them to learn in a way that is better suited their learning style. That's important because the value of reading isn't the reading itself, but the ability to understand the information that is encoded in the text, and that's what makes the Read 'n Style pen such a powerful tool. Throughout a normal school day, many teachers give handouts that they expect their students to read. This can be a nightmare for those that struggle with slow reading speed. The Read ‘n Style pen can ease your student’s nerves, letting them calmly listen to the text as they follow along. An hour of homework easily turns into three for students with dyslexia. By allowing students to listen to the text as they follow along, the Read ‘n Style pen decreases homework time while increasing the amount of material students are able to digest and comprehend. For many schools, the go-to “solution” for testing is to pull the student out of the classroom so the test can be read aloud without disturbing the other students. This can be humiliating for students who just want to fit in with their classmates. 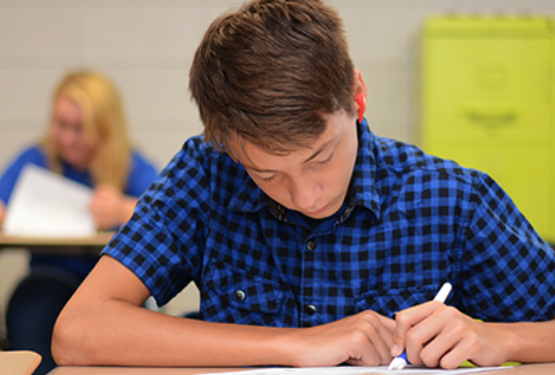 Because the Read ‘n Style pen can’t store information, students can use it on tests with no risk of cheating. This means your child will never again have to experience the pain and embarrassment of being pulled from the classroom. The Read ‘n Style pen brings stories to life. By reading text aloud, the Read ‘n Style pen helps struggling readers paint mental pictures, making reading enjoyable. From now on, accelerated reader points will be a breeze. Hidden Abilities, the startup company responsible for the Read 'n Style pen, is backed by the full support of The KU Catalyst, the University of Kansas' student business accelerator. The Catalyst has been an invaluable resource for the team, providing office space, mentoring, continuing education, professional contacts, and more. Hidden Abilities is creating a brighter future for those with dyslexia through the use of new and developing technologies. Founders Jamee and Payden Miller are working to do more than create helpful tools, they’re trying to create a change in the way society views dyslexia and spark a discussion about learning disorders in households around the world. Since we began working on this we’ve had a lot of ups and downs and false starts, but we’ve kept at it, always pushing forward. We’ve been incredibly fortunate in our pursuit of this, linking together with the just the right people at just the right time. We'd like you to meet our team. Our invention works by taking in information using a linescan camera, which is a little different than the cameras most of us are familiar with. Instead of taking a snapshot like an area camera, the linescan camera takes in thousands of vertical slices and stacks them side by side to create the image. The image is then sent to the processing unit which extracts the text, converts it to audio and sends it to a Bluetooth transceiver module. The Bluetooth module transmits the signal through the air to the user’s earbuds where it is played aloud. We're taking preorders right now through the Indiegogo website. If you're not familiar with it, Indiegogo is an online crowdfunding platform that helps creators find the resources and support they need to make their ideas a reality. Click the button below to go to the site, there you'll be able to place your order. As a reward for preordering we'll take $70 off the retail price.